The official story is ISIS stole them from the “Good Terrorists”, (Al Nusra), who were originally given their cool wheels by the US government. Which would seem to beg a couple of enquiries. 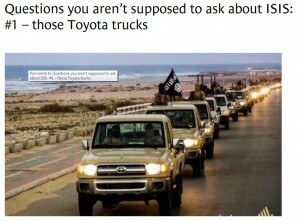 Not least of which is – why are the US giving any terrorists matching fleets of luxury SUVs? And for that matter, how many fleets are we talking about?